STRATFORD, Conn., Sept. 18, 2018 /PRNewswire/ -- Sikorsky, a Lockheed Martin company (NYSE: LMT), announced today that final assembly of the first HH-60W Combat Rescue Helicopter Weapons System and Operational Flight Trainers is underway, supporting the smooth entry of the aircraft into the U.S. Air Force fleet in 2020. Completion of the HH-60W training systems at subcontractor FlightSafety International's facility in Broken Arrow, Oklahoma, is expected in the first quarter of 2019. The Weapons System Trainer will be based at Kirtland Air Force Base, New Mexico, home of the formal HH-60W training unit. The Operational Flight Trainer will be at Moody Air Force Base, Georgia, site of the first operational unit. "I am excited to get these trainers in the hands of the U.S. Air Force Rescue Warriors," said Tim Healy, Director, Air Force Programs, Sikorsky. "The combat rescue mission is uniquely challenging in that it requires much of the mission planning to occur while in flight rather than prior to flight. This is due to the time-critical nature of the mission and the reality that the threat, location and condition of isolated personnel to be rescued are not fully known prior to takeoff. This requires that the aircrew become highly skilled at using the enormous networking and information capabilities that reside within the HH-60W, and that takes training and practice. These Weapons Systems and Operational Flight trainers will allow that training at the highest fidelity and realism ever seen." 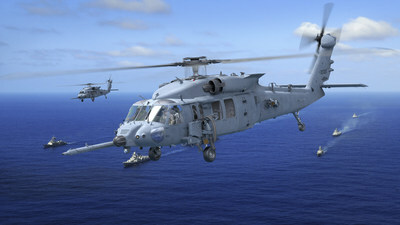 Sikorsky's current contract with the U.S. Air Force for the Engineering, Manufacturing and Development (EMD) phase of the program includes delivery of nine HH-60W helicopters as well as six aircrew and maintenance training devices, and instructional courseware designed specifically for the HH-60W aircraft. The Program of Record calls for 112 helicopters to replace the Air Force's aging H-60G Pave Hawk fleet, which performs critical combat search and rescue and personnel recovery operations for all U.S. military services.